SpaceX aims to launch the first Falcon Heavy rocket in November, company chief Elon Musk said Thursday, the latest in a series of schedule targets for the heavy-lift launcher’s delayed debut. Musk shared the updated schedule on social media late Thursday, a week after he tempered expectations for the Falcon Heavy’s maiden flight in remarks at an industry conference in Washington. A post on social media earlier this month from a passerby touring NASA’s Kennedy Space Center in Florida apparently showed all three of the Falcon Heavy’s first stage boosters inside SpaceX’s hangar near launch pad 39A, where the rocket will blast off on its inaugural flight. The images are a sign of visible progress on the Falcon Heavy. Attach mechanisms visible on the Falcon Heavy’s central core will connect two side-mounted boosters, each based on SpaceX’s Falcon 9 rocket first stage. The three rockets bolted together will generate 5.1 million pounds of thrust with 27 Merlin 1D main engines, making the Falcon Heavy the most powerful present-day launcher in the world once it flies. The Falcon Heavy will weigh more than 3.1 million pounds (1.4 million kilograms) fully loaded with kerosene and liquid oxygen propellants and stand more than 229 feet (70 meters) tall. If the demo mission gets off the ground successfully by the end of this year, two more Falcon Heavy flights are on the books in the first half of 2018, both from Florida. While the inaugural launch will not carry a customer payload, the Falcon Heavy missions next year will deploy satellites for commercial companies and the U.S. military. Musk first announced plans for the Falcon Heavy in April 2011, when he suggested the huge rocket could make its first flight by the end of 2013. Those plans were delayed multiple times, and SpaceX officials said the company temporarily sidelined the Falcon Heavy project in the wake of a Falcon 9 launch failure in 2015. 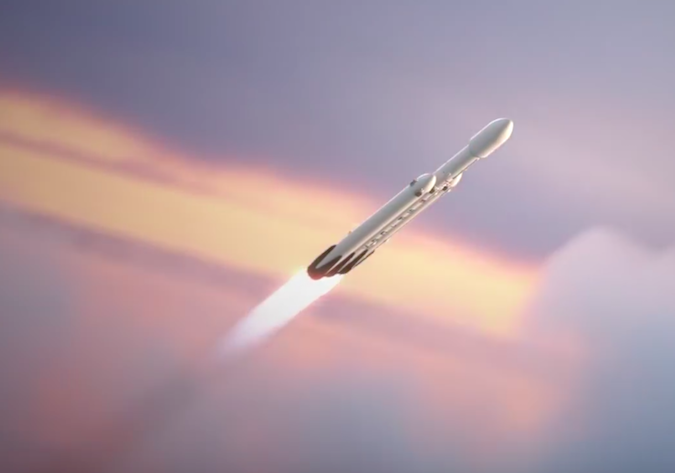 The Falcon Heavy will be able to loft the world’s heaviest commercial communications satellites, the U.S. military largest national security spacecraft, and send the company’s Dragon crew capsule on flights around the moon, according to Musk. SpaceX also planned to launch Red Dragon capsules on one-way flights to land on Mars aboard Falcon Heavy rockets, but the Red Dragon program, at least in its current incarnation, is in doubt after a design change on the next-generation Dragon spacecraft to eliminate the ship’s propulsive landing capability. 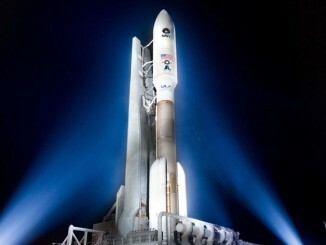 The Falcon Heavy rocket’s development delays forced some customers to switch their satellites to SpaceX competitors. Two satellites owned by ViaSat and Inmarsat were originally slated to launch on Falcon Heavy rockets, but those telecom operators opted to swap their SpaceX rides for launches on European Ariane 5 rockets operated by Arianespace. SpaceX aims to recover the Falcon Heavy’s two side boosters, which flew on Falcon 9 rocket flights last year and were modified with added nose cones, at a landing site at Cape Canaveral after the maiden launch. The company manufactured the center core new, giving it a strengthened structure, attach points, and other upgrades that make it different than a basic Falcon 9 booster. 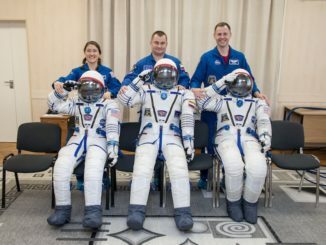 Musk last week said the Falcon Heavy turned out to be more difficult than originally expected. Read our earlier story for more on Musk’s comments last week. Repairs to SpaceX’s launch pad 40 at Cape Canaveral in the aftermath of a rocket explosion there last year will help determine when the Falcon Heavy will take off for the first time. 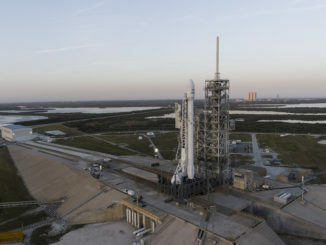 SpaceX plans to shift its Florida launch operations to pad 40 once it is available, allowing construction to resume at pad 39A to ready it for the Falcon Heavy. In the meantime, all of SpaceX’s Falcon 9 launches are departing from pad 39A, giving ground teams little time to modify the facility for the bigger booster.